Knee injections can be a great way to treat knee pain, swelling, inflammation and arthritis. Injections are a very effective way of targeting medication directly to the problem area in the knee and getting to work immediately. They tend to be more effective and have less side effects than oral medication. Here, we will look the different types of knee injection, what conditions they are suitable for, how they work and the risks and benefits of each. We will start by looking at corticosteroid knee injections, how they work, what conditions they can help and the possible side effects. Then we will go on to look at Joint Lubricant injections, concentrating on Synvisc Knee Injections. Cortisol is a hormone produced by your body, normally released by the adrenal gland when you are stressed, but the effects are short lived. Cortisone injections, aka steroid injections, are a close derivative of that natural product, but are enhanced to produce a longer term effect. Cortisone injections help relieve knee pain and inflammation. They are often combined with local anaesthetic. The local anaesthetic part of the injection provides instant pain relief and the cortisone part provides longer term relief of inflammation which consequently reduces pain. Steroid injections for knee pain are usually given when other treatments, such as medication and physical therapy, are not working. Why Have A Steroid Injection? Cortisone injections provide more targeted, rapid and powerful relief from inflammation than traditional oral anti-inflammatories e.g. ibuprofen. They also produce fewer side effects. The beneficial effects are usually noticed after a few days and can last for a few months. The accuracy of the technique will affect the results so they should be carried out by a physician with plenty of experience of giving steroid injections. Before a joint is injected, fluid may be removed from the joint for testing to help discover the cause of the inflammation. Cortisone injections for knee pain can be helpful for various causes of knee pain including bursitis, tendonitis, arthritis, cartilage tears and gout knee. They are one of the best ways to reduce pain and improve function, but they generally don’t cure the problem. They are best used as one part of a multi-factoral treatment programme which may include things like knee exercises, medication, knee braces and walking aids. 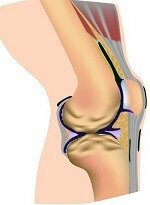 There are some short and long term complications linked with cortisone injections for knee pain, however, they are rare. The most common side effect is a temporary flare–up of symptoms for a couple of days. This happens in approximately 5% of cases and can be reduced by using Ice therapy. Usually, the number of cortisone injections given to a site is limited to three, and they should be at least three months apart. Animal studies have shown some weakening of tendons and softening of cartilage, hence the limit on the number you should have. Knee injections should only be carried out by qualified health professionals. If you are taking blood thinners such as aspirin or warfarin, you may need to stop them for a few days before your knee injection. You should always discuss this with your doctor first. You should avoid any strenuous activity for 48 hours after an injection to avoid the risk of injury. Another type of knee injection is joint lubricant injection. The most common one used at the moment is Synvisc. It uses a natural substance used to improve the cushioning and lubrication in the joint, making it particularly suitable for arthritis sufferers. Visit the Synvisc injections page to find out more. Knee injections are only one part of treatment for knee pain and work best when used in combination with other therapies. To find out more, visit the knee treatment section. If you need help working out what is causing your pain, visit the knee pain diagnosis section.